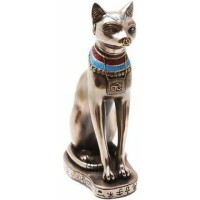 Amazing new depiction of Bastet, the Egyptian Cat Goddess who was the Goddess of Dance rejoicing in movement and music. 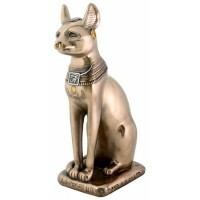 Stunning representation of Bastet, the Eyptian Cat Goddess as a beautiful woman with the ears of a cat. Beautifully detailed cold cast resin statue is hand painted to briing out every detail in bronze and gold. 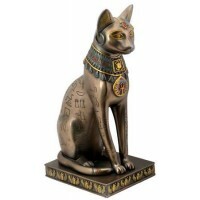 Bast was the Egyptian Goddess of Music, Pleasure and Dance - all beautifully represented here as a Goddess fit for any altar and stands 10 3/4 inches high. Item Number: PT-8857 | Approximate Size (Inches): 4.00 wide x 4.00 deep x 10.75 high | Approximate Shipping Weight: 4.00 lbs.